The observable Universe is an extremely big place, measuring an estimated 91 billion light-years in diameter. As a result, astronomers are forced to rely on powerful instruments to see faraway objects. But even these are sometimes limited, and must be paired with a technique known as gravitational lensing. This involves relying on a large distribution of matter (a galaxy or star) to magnify the light coming from a distant object. Using this technique, an international team led by researchers from the California Institute of Technology’s (Caltech) Owens Valley Radio Observatory (OVRO) were able to observe jets of hot gas spewing from a supermassive black hole in a distant galaxy (known as PKS 1413 + 135). The discovery provided the best view to date of the types of hot gas that are often detected coming from the centers of supermassive black holes (SMBH). The research findings were described in two studies that were published in the August 15th issue of The Astrophysical Journal. Both were led by Harish Vedantham, a Caltech Millikan Postdoctoral Scholar, and were part of an international project led by Anthony Readhead – the Robinson Professor of Astronomy, Emeritus, and director of the OVRO. This OVRO project has been active since 2008, conducting twice-weekly observations of some 1,800 active SMBHs and their respective galaxies using its 40-meter telescope. 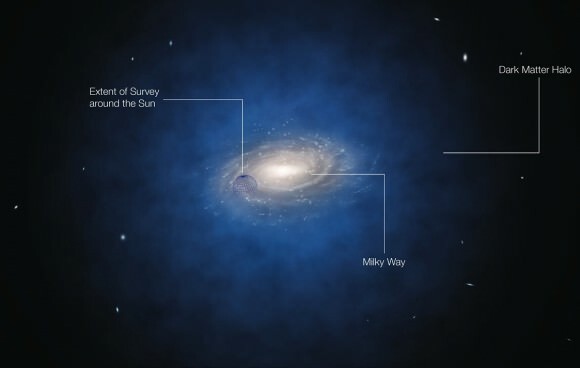 These observations have been conducted in support of NASA’s Fermi Gamma-ray Space Telescope, which has be conducting similar studies of these galaxies and their SMBHs during the same period. While all large galaxies are believed to have an SMBH at the center of their galaxy, not all have jets of hot gas accompanying them. The presence of such jets are associated with what is known as an Active Galactic Nucleus (AGN), a compact region at the center of a galaxy that is especially bright in many wavelengths – including radio, microwave, infrared, optical, ultra-violet, X-ray and gamma ray radiation. These jets are the result of material that is being pulled towards an SMBH, some of which ends up being ejected in the form of hot gas. Material in these streams travels at close to the speed of light, and the streams are active for periods ranging from 1 to 10 million years. Whereas most of the time, the jets are relatively consistent, every few years, they spit out additional clumps of hot matter. Back in 2010, the OVRO researchers noticed that PKS 1413 + 135’s radio emissions had brightened, faded and then brightened again over the course of a year. In 2015, they noticed the same behavior and conducted a detailed analysis. After ruling out other possible explanations, they concluded that the overall brightening was likely caused by two high-speed clumps of material being ejected from the black hole. What was also exciting about the international team’s observations was the nature of the “lens” they used. In the past, scientists have relied on massive lenses (i.e. entire galaxies) or micro lenses that consisted of single stars. However, the team led by Dr. Vedantham and Dr. Readhead relied on an what they describe as a “milli-lens” of about 10,000 solar masses. What’s more, the researchers indicate that the lens itself is of scientific interest, for the simple reason that not much is known about objects in this mass range. This potential star cluster could therefore act as a sort of laboratory, giving researchers a chance to study gravitational milli-lensing while also providing a clear view of the nuclear jets streaming from active galactic nuclei. Looking ahead, the team hopes to confirm the results of their studies using another technique known as Very-Long Baseline Interferometry (VLBI). This will involve radio telescopes from around the world taking detailed images of PKS 1413 + 135 and the SMBH at its center. Given what they have observed so far, it is likely that this SMBH will spit out another clump of matter in a few years time (by 2020). The studies were made possible thanks to funding provided by NASA, the National Science Foundation (NSF), the Smithsonian Institution, the Academia Sinica, the Academy of Finland, and the Chilean Centro de Excelencia en Astrofísica y Tecnologías Afines (CATA). How can an exploding star appear far brighter than expected? This question vexed astronomers since the discovery of PS1-10afx, supernova that was about 30 times more luminous than other Type 1A supernovas. Astronomers have just confirmed in Science that it was likely due to well-known illusion in space. The mirage is called a gravitational lens that happens when a huge object in the foreground (like a galaxy) bends the light of an object in the background. Astronomers use this trick all the time to spy on galaxies and even to map dark matter, the mysterious substance believed to make up most of the universe. Check out some spectacular images below of the phenomenon in action. 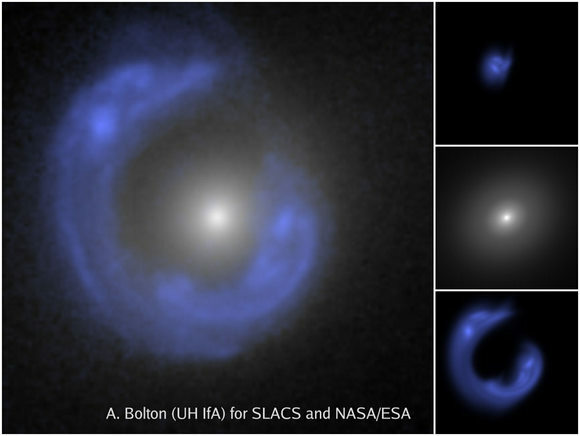 Hubble Space Telescope image shows Einstein ring of one of the SLACS gravitational lenses, with the lensed background galaxy enhanced in blue. A. Bolton (UH/IfA) for SLACS and NASA/ESA. The HST WFPC2 image of gravitational lensing in the galaxy cluster Abell 2218, indicating the presence of large amount of dark matter (credit Andrew Fruchter at STScI).